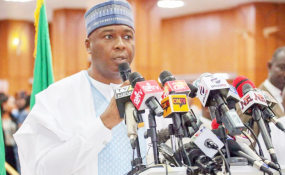 Abuja — Senate President Bukola Saraki has been named the director-general of campaign of the Peoples Democratic Party (PDP) presidential candidate, Alhaji Atiku Abubakar. The appointment, which had been subject of media speculation for days, was confirmed to THISDAY this morning by the party's National Publicity Secretary, Mr. Kola Ologbondiyan, who said zonal coordinators had also been named after long hours of meetings by the PDP hierarchy. Meanwhile, the party formally set the machinery in motion for the reconciliation of all aspirants that contested its presidential ticket in Port-Harcourt penultimate weekend in an attempt to rally them behind the party's presidential candidate, Alhaji Atiku Abubakar. The reconciliation moves started yesterday with a visit to Sokoto State Governor, Alhaji Waziri Tambuwal, and former governor of Kaduna State, Senator Ahmed Makarfi, in Abuja. With Dickson were Delta and Taraba States governors, Dr. Ifeanyi Okowa and Mr. Darius Ishaku. Speaking after the meeting, Tambuwal accused President Muhammadu Buhari of maladministration, saying that the way the country was being run by proxy was unacceptable and won't be allowed to continue after May 29, 2019. Tambuwal assured the party and Nigerians that he was committed to the success and victory of the party at the general elections in February, 2019. He stated, "We have had a robust and fruitful engagement on the way forward. And I have made my commitment immediately after the convention that I am going to support our candidate, Waziri Adamawa, Atiku Abubakar, 100 percent for us to have victory at the general election. "So, I am not wavering, I am not looking back. Work has started for us to ensure that the PDP family remains united and other lovers of democracy come and partner with us for us to ensure that we convincingly win this election. It is not about my personal ambition. "It is about this country. And all of the issues we have discussed, canvassed and traversed for during our encounter with delegates and party leaders, have remained there." He said the misgovernance of Nigeria under the ruling All Progressives Congress (APC) had to stop. "We want a situation whereby the President of Nigeria will be hands on on issues of good governance, respect for the rule of law and the way this country is governed. So, I have given my commitment and I mean it, I am out for it. By the grace of God, we shall support Atiku Abubakar and PDP to win elections throughout Nigeria", he said. The Bayelsa State governor commended the former presidential aspirants for displaying maturity and spirit of sportsmanship after the Port Harcourt Convention, which was won by former Vice President Atiku Abubakar. Dickson who is the Chairman of the Committee said that the party had commenced series of consultative talks with all the aspirants and leaders of the party in the bid to retake political power from the APC in 2019. According to him, "I am leading a team of the committee of governors to interact and compare notes with our brother, His Excellency Governor Aminu Tambuwal of Sokoto State. As you all know, he ran a great race and we are all proud of what he did and what he continues to do. We appreciate his statesmanship; we appreciate the way and manner he has been of help to the party consolidating the gains the party is making. "This afternoon, as part of our decision to go round, visit, encourage and interact with all our party leaders especially all those who indicated interest in the last presidential elections, we have held a fruitful meeting. "We are actually starting from here and would be leaving from here to visit our former national caretaker chairman and also hold similar consultative meetings with him." On his part, the former caretaker chairman of the PDP, Senator Ahmed Makarfi urged Atiku to include all the former presidential aspirants so that they could galvanise support for him. He said while the aspirants went into the election as aspirants, they emerged collectively as a party. He said he had long years of national and political relationship with Atiku, which had not changed, stressing that the PDP would be victorious in the 2019 elections.